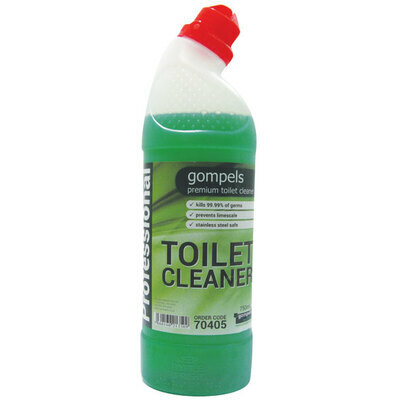 A handy and compact addition to your cleaning resources, our Gompels Toilet Cleaner 750ml has been manufactured to offer the same powerful performance as leading brands. Providing a highly effective germ control formula with a delicate base and gentle enough to be used on stainless steel, it has been shown to fight against 99.999% of germs. The cylindrical plastic bottle and angled head allow you to target the inner rim of your pan without risking contamination on hands. A security lid prevents younger hands from accessing the cleaner while a flexible bottle ensures you are able to control the amount of product used per clean. Our toilet cleaner is also available in a multi pack of 8x 750ml bottles for your replenishment needs while our Bottle and Nozzle for Toilet Cleaner offers a more hygienic option to your routine.